Thanks for using “Auto Bcc Cc for Gmail & Inbox by Gmail”. The extension is free for personal use. 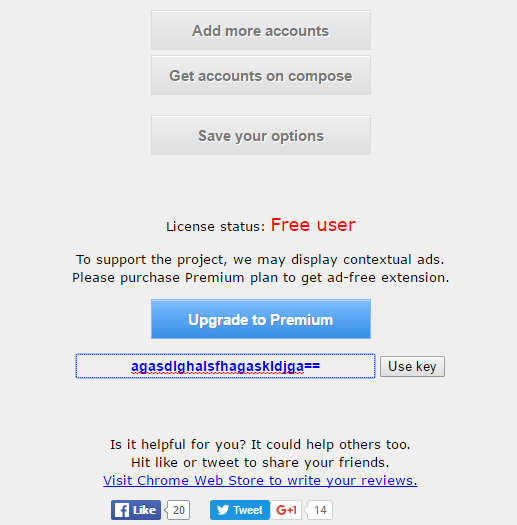 For commercial or company users, please upgrade to Premium. 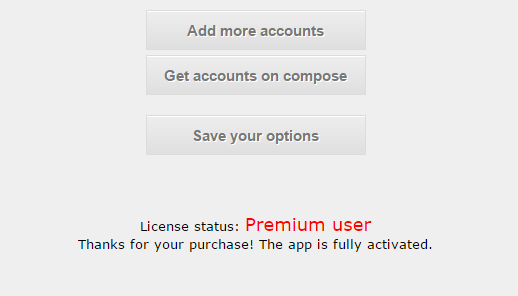 To get a license, click “Upgrade to Premium” in the extension’s Option page and follow instructions. Or you can access our payment gateway at this page. The available plans are: $4.99 for 2 PCs, $19.99 for 20 PCs, and $89.99 for 100 PCs. When paid, we will send a license key to your email. You may enter this key in the extension’s Option page to activate on multiple computers (browsers). You can share this key with your colleagues. Enter your license key in Option page, and click “Use key” to activate it. If you have more than one computer (browser), you should activate the license on each of the computers (browsers). Reactivate license every time you reinstall AutoBcc or install it on a new computer (browser). Our Browser Extensions collect and store anonymous information about specific webpages, debugging information of how the extension works on those webpages. The information collected by the extension is completely an onymous and can’t be personally identifiable. We use these information for improving the extensions' workflows and bugs fixing. We do not use them for any commercial purpose and do not sell them to any third party. Autobcc.com does not require you to provide us information for using most of our services. Therefore, you can always choose not to provide such information. You may disable the Browser Extension from reporting anonymous information by using the Options menu in the Browser Extension. If supported, you may configure in the Options menu in the Browser Extension. Auto BCC CC Gmail & Inbox helps you automatically add BCC/CC emails everytime you compose an email or reply, forward mail. 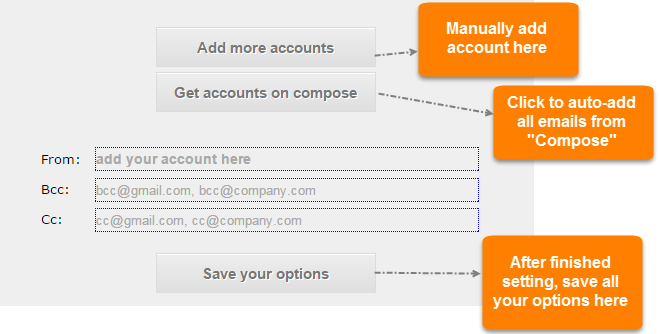 You can flexibly set multiple “From” Google mail accounts to match with its “BCC” & “CC” Emails. 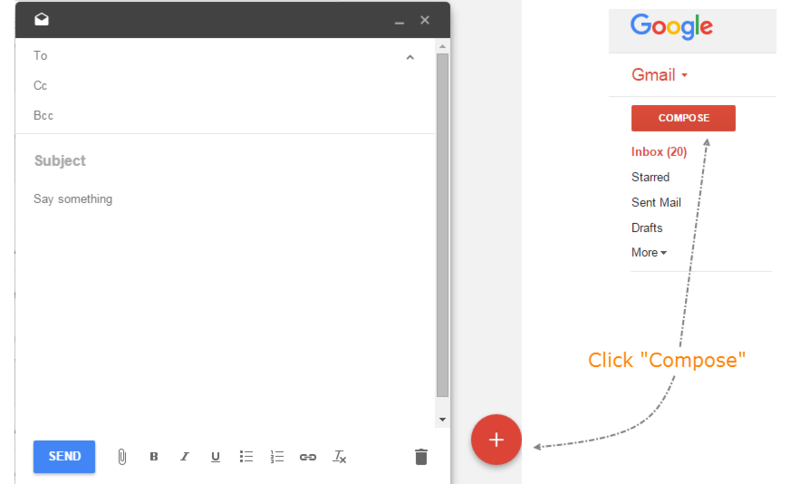 Auto BCC/CC can be used in both GMail & Inbox by GMail user interface. You can install the extension in Chrome Web Store. 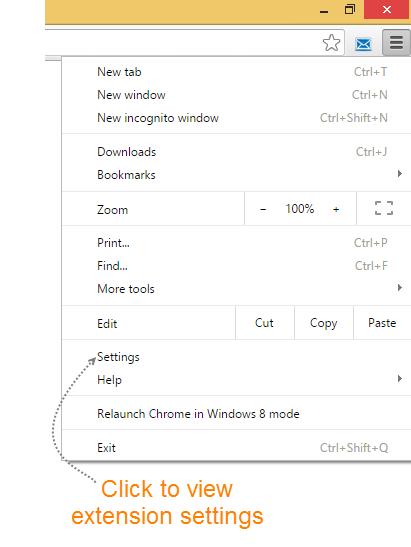 – Restart Chrome browser after installation. – Go to Gmail™ (https://mail.google.com/) or Inbox by Gmail™ (https://inbox.google.com/). – Click “Compose” once to tell the extension to grab all “from” accounts.